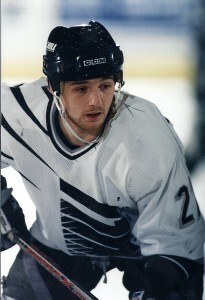 Derek Clancey (1993-97): Collected 313 points (95 goals and 218 assists) in 221 games … Led the Chill in scoring in 1994-95 with 87 points (21 goals, 66 assists) in 63 games and 1995-96 with 109 points (32 goals, 77 assists) in 67 games. Also had 26 goals and 33 assists in only 46 games the next season… his jersey once auctioned off for more than $3,000 at a charity event …. Currently Director of Pro Scouting for the Pittsburgh Penguins.